‘We are going to find a South African solution that will lead us to an end that will be wholesome for all of us,’ the president said. South Africa is winning the support of foreign leaders for its land reform drive and there was no reason to fear the country would face sanctions, President Cyril Ramaphosa claimed today. Ramaphosa told the National Council of Provinces that British Prime Minister Theresa May had voiced support for orderly land reform, and Belgian Deputy Prime Minister and Foreign Minister Didier Reynders had expressed similar sentiments in talks with his local counterpart Lindiwe Sisulu. “She welcomed the way in which we are approaching the process and understood that land reform could unlock economic investment,” Ramaphosa said of his talks with May last month. Reynders, he added, showed a “keenness on his part to say I understand and you have to deal with this matter and address it”. The president said he had not had any direct engagement with the United States government following claims on Twitter by President Donald Trump that white-owned farms were being seized but that the US charge d’affaires in Pretoria had been urged to convey South Africa’s “deep concern”. He added that Sisulu had also spoken to US Secretary of State Michael Pompeo and that the government had sent an aide memoire to the US consulate to point out that South Africa was following “a consultative process on the issue of land and agrarian reform”. The government has furthermore instructed its diplomatic missions around the world to engage with their host governments on the issue “so that the message may sink into the minds of those who may not agree with us”. He said he had engaged with people who were aggressively opposed to the state’s plans to speed up land reform but changed their minds when they heard that the majority of the population were relegated to 13 percent of the land in the country. 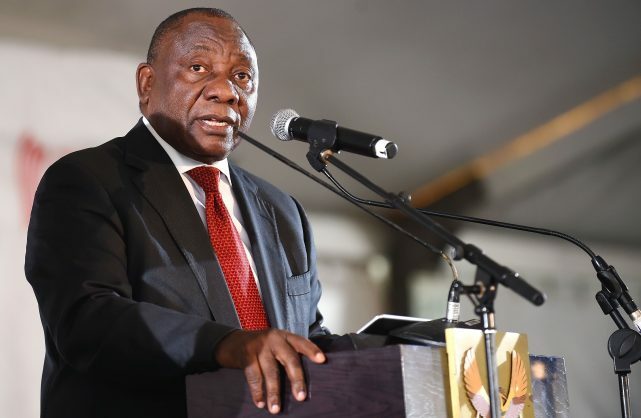 Ramaphosa went on to say the majority of South Africans backed the government’s plans for orderly land reform, in line with the Constitution, that would address the historical imbalance created by the segregation laws a century ago. Of comparisons to the failed land reform system in Zimbabwe, Ramaphosa said South Africa had a track record of finding workable solutions to seemingly intractable problems. He said the parliamentary process of reviewing section 25 of the Constitution was part of a “wonderful debate” on the issue that should put paid to “fake news” on the subject. “Those are currently being discredited,” he said. Ramaphosa said financial institutions were asking to engage with government to contribute to sensible land reform measures. The debate on land reform has become increasingly heated since the president signalled at the end of July that the ruling party planned to amend section 25 to make explicit the circumstances under which the state could expropriate land without compensation. He dismissed suggestions from MPs today that the policy stance has harmed his government’s efforts to attract foreign investment.